ANNOUNCING: Odin Serializer Goes Open Source! The Odin Serializer is now Open Source! A few months back, Sirenix, the developers for whom we publish Odin Inspector and Serializer, brought up an interesting idea; what if we make the serializer in Odin open source, allowing both developers and asset store publishers to freely use it and contribute to make it even better? Needless to say; we loved the idea, and as of today - the most powerful serializer for Unity is now open-source! To celebrate the launch, we've teamed up to create a giveaway with two kickass companies, who will be integrating Odin Serializer in their own products; Ludiq, the creator of Bolt, and ParadoxNotion, the creator of NodeCanvas and FlowCanvas. When we say that the Odin Serializer is powerful, we mean it. 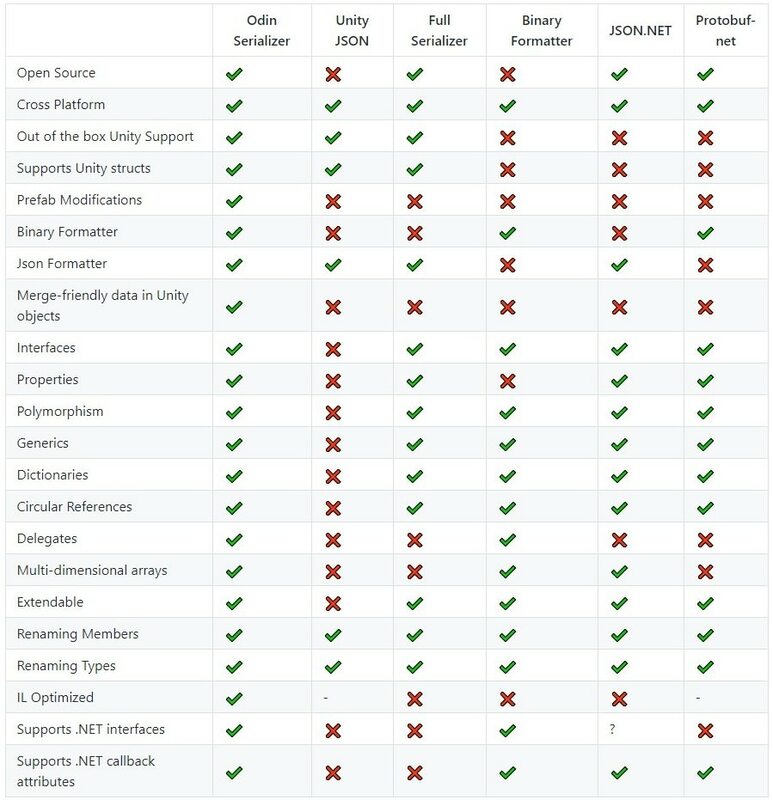 Just have a look at the comparison chart below, and check out GitHub for further performance tests and benchmarks. Click here if the image doesn't load properly. Why are we Open Sourcing Odin Serializer? That's a good question, and I sat down with Bjarke from Sirenix to talk about that and what it means for existing Odin Inspector & Serializer customers. So, why did you choose to open source the Odin serializer? There are several reasons! The main reason is that there is a demand for it. Many people have been interested in just the serializer. We've had many questions about Odin serializer from various Asset Store developers such as Lazlo - developer of Bolt, and Vaggelis - Developer of nodeCanvas, who are currently using FullSerializer. In short, they were interested in the performance, feature and stability boost that Odin's serializer could provide them. We loved the idea, but it was hard to find a fair model that made financial sense for us. Secondly, many companies and developers have been hesitant about integrating the serializer, even though it would have been the ideal solution to their problem. What would happen if Sirenix suddenly stopped maintaining it, and they encounter a breaking bug? By open sourcing it, we'll get a lot more people involved with the project and it'll no longer be dependent on the survival of a single company. What does this mean for people who already own Odin Inspector & Serializer? It means that the serializer will become even better - more stable, performant and reliable - as its userbase grows and open source contributions start coming in. Odin Inspector still retains its full value for pre-existing customers - namely that of vastly improved editor customization, as well as inspecting the data that is serialized by the serializer, and handling the management of custom-serialized prefab modifications seamlessly (no simple task!). The serializer as a stand-alone library is a specialized tool that will require far more know-how of its users than the highly polished and integrated serialization experience you get with Odin Inspector. What’s cool about the Odin serializer? Everyone can now freely and easily integrate Odin's serializer as a standalone library, and use it to save and load their data both at runtime and from the editor. They can now serialize data-structures that Unity’s serializer doesn’t know how to handle, such as graph structures, generics, and all of the built in .NET data types such as dictionaries, hashsets, linked lists and so on. Keep in mind though, that we're only open sourcing the serializer, not the inspector. The serializer doesn't come with any tools for viewing and modifying the data in the inspector; it's just a serializer. For that, you'll need to do your own custom editors, or, you know... you could check out Odin Inspector. To get started, head over to GitHub to read much more, and join Discord to discuss and ask questions.